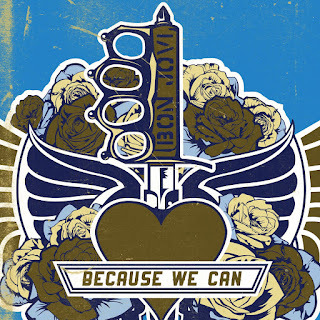 The first video for Bon Jovi's latest single Because We Can is out (There will apparently be four videos in total). Do you like the video? I couldn't work out if I found the closeups and camera angles cool/interesting or disorienting/trippy but I'm intrigued to see the rest of the story. 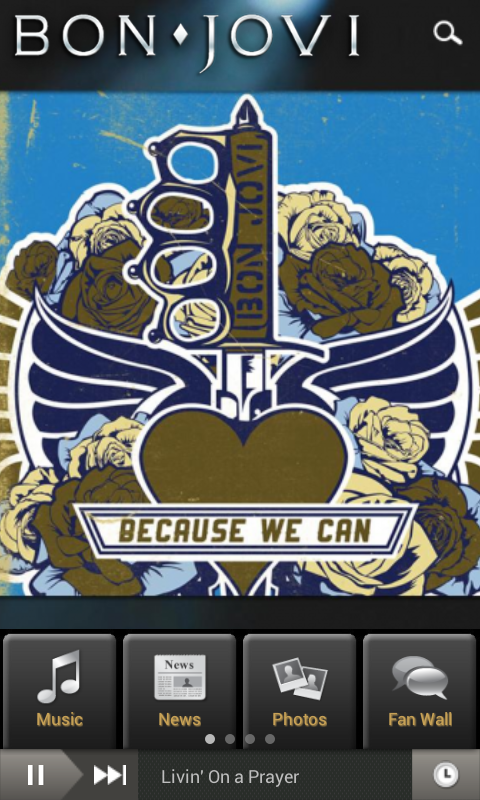 Meanwhile, a 90 second audio clip of What About Now has been released on the Bon Jovi app. Augmented reality has arrived in Jovi Land in the form of a Because We Can heart and dagger animation and sneak peak of the new music video. 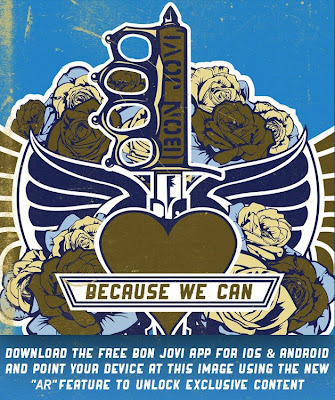 Download the Bon Jovi app. You may need to go to your app store (iOS App Store or Google Play) and update it to the latest version. Open the app and click on the Augmented Reality tab. Point your smartphone or tablet at the image below (The image is also on Bon Jovi's Facebook and Twitter). It may take a little while to focus but the app should open the animation. Tap on the dagger (You should see a "Tap here" prompt on your screen) to start the music video. Tap on the video to expand the view. Bon Jovi played several songs from their upcoming album What About Now for the first time during a BBC Radio 2 show on January 24, 2013. You can listen to the show here (after a news update), including all the stage and audience banter and the technical difficulties just before Livin' on a Prayer. I'm With You was apparently also played given a video of it has surfaced but unless I blacked out somewhere along the way, it wasn't in the broadcast. Here are videos of the new songs. Not Running Anymore was reportedly going to be on the album as well, so perhaps it will be a bonus track. Meanwhile, Bon Jovi was also the first act announced for the Barclaycard British Summer Time series at London's Hyde Park. Bon Jovi will play on July 5, 2013 with tickets going on sale February 1. You can read more info and watch the press conference here. All the tour dates so far are on the Bon Jovi website. Anyone planning to go to Hyde Park? In the Bon Jovi video, Duddy stars as a boxer-turned-soldier who spots the woman of his dreams while in the ring mid-fight - with the distraction leading to a knock out. Thereafter, the pair never chance to meet, despite many efforts, and eventually John’s character gets sent off to war without ever seeing her. In a fitting Bon Jovi ending, the pair reunite at the end, with Duddy’s character sweeps her of her feet. “We did the video in December and it was like a short film really, one song with four different videos. It was brilliant to be involved with. And I get knocked out in the video too! Check out the full Derry Journal article at this link. 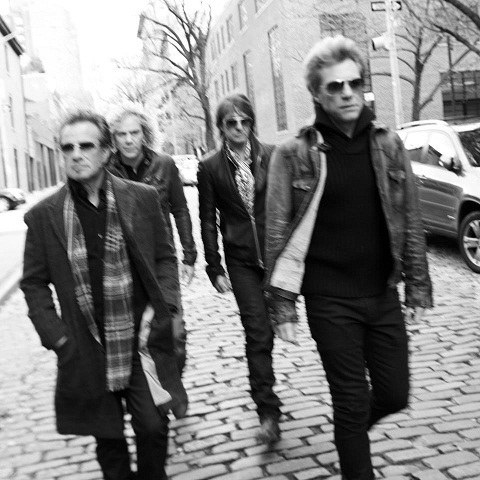 Check the Bon Jovi website for more details on all the tour dates so far. Do you like this version? How do you think the song stacks up live (albeit acoustic and not performed by Bon Jovi)? I also posted Will Black's cover of Richie Sambora's Every Road Leads Home to You back in August, so check it out if you haven't already. And here is a cover of Livin' on a Prayer that Will uploaded about three years ago. Meanwhile, here's a short video of Jon talking about Because We Can. Although these 55 seconds make it sound like a protest song, which isn't the impression I got from actually listening to the song. The following lyric video has also been released. Because We Can: Listen to Bon Jovi's new single! Because We Can can be downloaded from the iTunes Store now. What are your first thoughts on the song? And are you now feeling optimistic, pessimistic or neutral about the new album? My personal thoughts? Well, it's catchy enough and sounds like something that could slot into some current top 40 stations (I'm sure this was intentional) -- assuming such stations played Bon Jovi, which they generally don't, unfortunately. I've enjoyed it on the first few listens but once the novelty wears off, who knows? I also feel there is a real disconnect between the verses (which sound like they are trying to tell an older "Tommy and Gina" story) and the chorus (which sounds like yet another attempt to recapture It's My Life)... Just my opinion though. I'd love to hear yours. Retired Irish boxer John Duddy is set to star in the music video for Because We Can. @paul_mccloskey all good. Busy over Christmas Paul. I got to be the lead in Bon Jovi music video.out on Jan 15. Give our love to the family. What About Now comes out on March 26 and will apparently include Jon's Golden Globe-nominated song Not Running Anymore from the Stand Up Guys soundtrack. 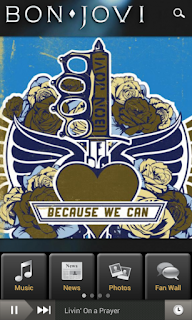 Bon Jovi's new song Because We Can hits airwaves on Monday, January 7 and the Bon Jovi app has revealed the artwork for the single. What do you think of the re-imagining of the heart and dagger? You can download the Bon Jovi app for free via the Mobile Roadie website or search for it in the iTunes Store or Google Play. There seems to be a real push from the Bon Jovi camp to embrace the mobile trend, and Jon has indicated the app will play a key role in the album cover for What About Now.